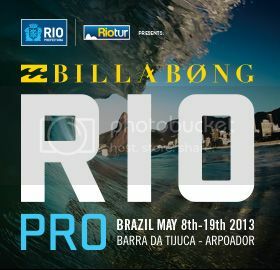 Billabong Pro Rio at Barra Da Tijuca, Arpoador runs May 8th - 19th. Adam Melling surfs Ht 10 vs Jordy Smith and Kai Otten. Owen Wright is out of the event but Tyler will start in Ht 4 of the womens event. Good luck. Mello started round 1 with a sick barrel that scored a 9.57 and led for 20 minutes but couldn't find a back up and finished 2nd. Click here for the Heat Analyzer. Tyler has defeated Sally Fitzgibbons 17.80 to 15.67 to win the Colgate Plax Girls Rio Pro in peaky two-to-three foot waves, simultaneously taking the frontrunner position on the 2013 ASP Women’s World Championship Tour (WCT). Ty dominated the Barra Da Tijuca lineup from start to finish, unleashing forehand combinations to seal the deal. Mello was leading his Round 2 heat until the final minute when Kai Otten was given the nod by 0.04 points in the worst waves for a WCT event in recent history.